Fresh-faced Trevor Noah made his debut as the host of The Daily Show With Trevor Noah on Monday night, and, overall, things went pretty smoothly. The reviews are in from all over, and while the critics are split about Noah's performance,,I'm sure there's really only one reviewer he cares about: his predecessor and mentor, Jon Stewart. So what did Jon Stewart think of Trevor Noah's first show? It's safe to say that Stewart was probably pleased as punch and reassured he made the right choice putting Noah in his chair (and, hopefully, sent him a congratulations text complete with Pope-themed emoji). 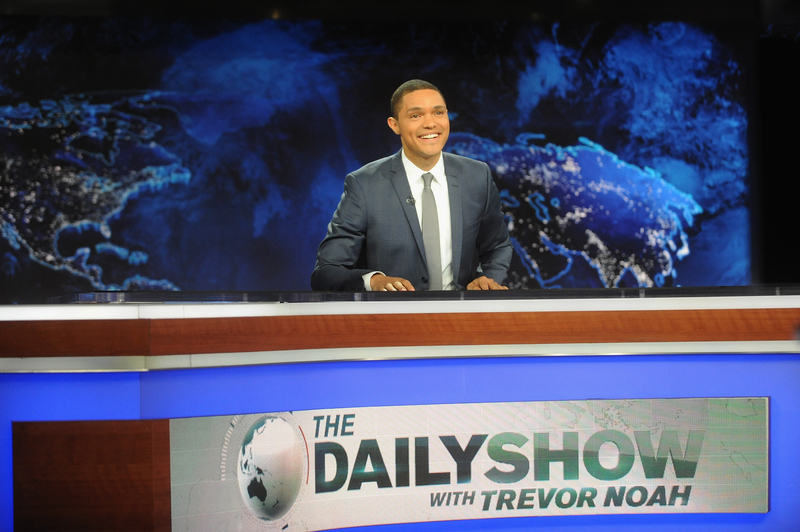 Trevor Noah opened the show with what was expected of him — his "global perspective." But he subverted it and nailed it right out of the gate, joking: "Growing up in the dusty streets of South Africa, I never dreamed that I would one day have, well, two things, really," he began. "An indoor toilet and a job as host of The Daily Show. Now I have both, and I'm quite comfortable with one of them." He was jovial, he was well-spoken, and gosh darnit, he was handsome. Beyond that, he was self-aware about his status as an "outsider" — a black, South African comedian. Noah dedicated his opening monologue to thanking Stewart for what he did at TDS, and committed himself as the new host to continuing the war on bullsh*t that, for so many years, Stewart was a leader in. For that alone, I'm sure Jon Stewart was proud. The critics noted that Noah has a much smoother, more polished style than Stewart's neurotic, often physical comedy (though Noah did pay homage to Jon with a spit-take). Larry Wilmore, another Daily Show alum, told Terry Gross the tadvice that Jon Stewart gave him when he became the host of The Nightly Show: "'Hey man, stop being a host. Stop it. Just be yourself.' It took a while for me to interpret it, but what it is, when you're first starting a show like that, you're acting everything because you're not comfortable yet. But you can't fool Jon. He can see right through that," Wilmore said on the eve of his 100th episode. And that's why I think Stewart is probably resting easy, knowing that Noah is the right choice. Though Noah obviously had some stumbles during his first episode — like his Whitney Houston joke, and a d*ck joke about the Pope that was more than a little unsavory — he made the first episode of his Daily Show a good-natured play on the anxieties the public had about him as the new host. He was open and genial, but made it clear that the new Daily Show would have a lot more to say about the black experience in America — and included an amazing segment about going to Mars from new correspondent Roy Wood, Jr., that proved it. Though Stewart hasn't released his own review of Noah's performance just yet, I think he'd be happy with the authenticity that Noah brought to the set. Noah called himself the new, black step-dad to Jon Stewart's role as a political father (now absent), and the joke was not only hilarious but also incredibly self-aware. I like to believe that is Stewart's ultimate goal in the war on bullsh*t: to know yourself and where you stand with your values. Back when Jon Stewart defended his successor in April after a series of offensive tweets from Noah's Twitter account surfaced, he said of the new young host: "Trevor Noah will earn your trust and respect. Or not. I hope you give him an opportunity to earn that trust and respect," and called him an "incredibly thoughtful, considerate, funny and smart individual." I think Noah's show lived up to Stewart's expectations, and I don't think Stewart will have any regrets about the man he chose for the job. Noah was, aggressively and hilariously, himself on his first night hosting. He's still got those big shoes to fill, but I think we can all rest a little easier now — and I bet Jon Stewart would agree.